How do you make a homemade grilled hamburger even better? Add some shredded cheese and barbecue sauce into the mix. 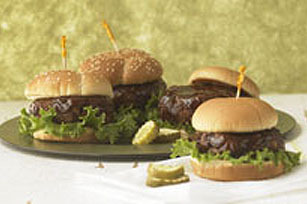 These Cheesy Beef Burgers are simple, but oh-so-good! Preheat barbecue to medium-high heat. Mix meat, cheese, bread crumbs and 2 Tbsp. of the barbecue sauce. Shape into four patties. Place patties on barbecue; cover barbecue with lid. Grill 4 to 6 min. on each side or until burgers are cooked through (160°F), brushing with remaining 2 Tbsp. barbecue sauce during last 2 min. of grilling time. Fill buns with burgers and lettuce, if desired. For an additional flavour kick, add 2 Tbsp. Kraft 100% Parmesan Grated Cheese and 1/4 tsp. Italian seasoning to the meat mixture. Serve with pickles. Serve these delicious burgers with a fresh fruit salad.